Raydium 3D Game Engine • View topic - anisotropic filtering ! Post subject: anisotropic filtering ! Since a few minutes, Raydium now features an anisotropic filter. Raydium texture filters are now "none", "bilinear", "trilinear" and "aniso". For this test, FPS was 124 for the standard bilinear filter, 115 with an 8x aniso and 95 with the 16x. I think I'll add an "anisotropic filter" option the game menu, since it looks great (I think) and it does not cost so many FPS if you've a correct 3D hardware (ATI Radeon X600 SE for me). You can now activate this filter in any Raydium application using the "--filter aniso" command line switch. 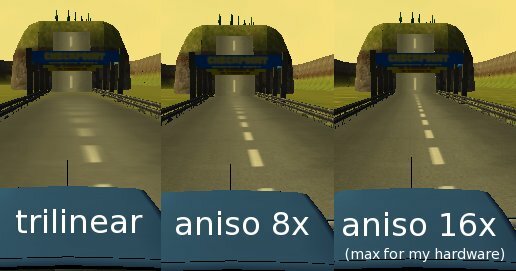 It will automatically use the maximum anisotropic level for your hardware, but you can limit this using the "--max-aniso x" switch. For developpers, you only have to change the usual raydium_texture_filter_change(RAYDIUM_TEXTURE_FILTER_TRILINEAR) to raydium_texture_filter_change(RAYDIUM_TEXTURE_FILTER_ANISO) in your init of Raydium. This new features it supposed to fallback automatically to trilinear filter if anisotrpic filter is not available for the hardware (max aniso level = 0), but we may have to check this (the same story happends for shaders, were Raydium was segfaulting if GLSL support was not available). With Linux, you can check if this feature is available using "glxinfo | grep GL_EXT_texture_filter_anisotropic".